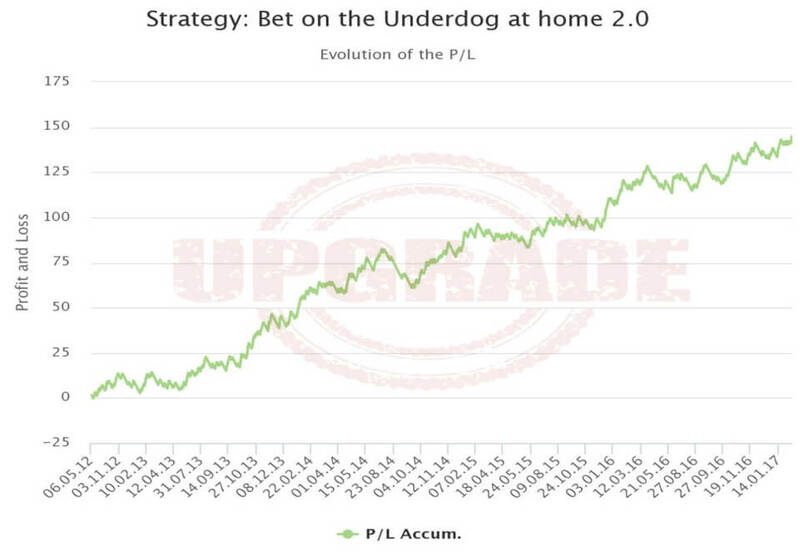 In the spirit of improving as well as making the procedure more user-friendly, we have developed a new enhanced version of the original strategy “Bet on the Underdog at home”. We received feedback from our users regarding receiving the picks much further in advance. As the conditions were based on the closing odds, it was not possible to send all the picks earlier, because some games don’t reach the odds required until a couple of hours before the match starts. We understand sometimes there is no time to place a bet if you receive the picks a few hours before the game, besides the trouble to keep an eye on the odds movement. Therefore, now the follow-up is more convenient, whether you are subscribed to the strategies or follow the system on your own account. This system is based on the trends of the teams for a short time, the last three games. The goal of this strategy is to search teams playing at home with a good winning streak as a Home team, and the rival team should have the opposite trend: NO Wins when played away in the last three games. We are searching games where the good results of the home team in the short term can continue, at least in the next match. We want to take advantage of the good form of the home teams, although the odds set for that team are against them. Leagues. We have tested this strategy with 27 leagues. Date range. From May 2012 to 15/02/2017. Home Team conditions. At least two wins in the last three games played at home. Away Team conditions. No wins in the last three games played away. Odds for Home Team. Opening odds must be greater than or equal to 2.60 (decimal odds). The Trigger of the system. If those conditions are fulfilled, the system places a bet on the fourth match on the Home Team to win. Yield. The Yield obtained in the system: 19% after 766 bets matched in the strategy. For this betting system, we obtain a 38% ratio of winning bets. This is because the odds selected in the strategy are a bit high. The past results show that about one in three bets is a winning bet. You should consider all these factors explained above before taking a decision. If you decide to follow this strategy, please remember that you have the final say to place a particular bet. The system obtains a positive result, a 19% yield after 766 bets during five years. As you can check, the system is profitable for most of the football leagues tested. Turkey Superlig scores the best result with a Net Profit of +23.78, that means a 72% Yield closely followed by Serie B (Brazil) with 69% Yield. Only four leagues have negative results for this study, Belgium, Spain Primera Division, Bundesliga 2 and Italy Serie A. If we analyse the results by odds range, we can confirm that the system works for every interval, where the yield keeps constant at each odds and for every year. Each interval has a consistent profit; that means that those odds fit for the strategy. The best odds interval is between 2.60 and 3.00 (opening odds), with 46% of the total profit. If you look closely at the chart, you can realise the profits increase slowly, but gradually. Here, the strategy suffers the worst negative streak between August and September 2014, it lasted only for a couple of months, although adding about 20 points of losses. But the best part was that it recovered relatively early, in November 2014. Besides, there are some extended periods of time, close to one year, where the strategy generated hardly any profit, as it happened from January to October 2015. The drawdown for the period studied is not very high but a little long. Estimated level of risk: MEDIUM. For this strategy, the Approx. P-value = 0.001, wich means we have strong evidence that the results for this systems are not a matter of only luck. We advise following this strategy for a long period of time. If you follow a strategy like that, it may take several months until it starts making a profit, but if you leave the system too soon, you could miss te good results for the future. One of the worst enemies of the bettor is usually the impatience. In case you decide to pursue this strategy, please take into account all theses factors before starting this adventure. We think this system can be very profitable in the long term, but as you already know, cycles can change, and past results do not guarantee future performances. This strategy will be reviewed periodically to make small enhancements to improve the end result.